Club Penguin Cheats by Mimo777 Club Penguin Cheats by Mimo777: Club Penguin Rockhopper's New Background! Don't forget, if you find him you will also earn a stamp! So get out there and find him! Let me know if you find him and what all he says to you, k? Hope you are having fun at the Fair! Cool. I found him last night. Got the stamp and his background. Lots of new famouse penguin backgrounds lately, huh? Mimo, where is the Rockhopper Comment Trackerr? I've seen a lot of people with the background, but I still haven't found him! I'll have a search tomorrow! Mimo can u do a comment tracker 4 rockhopper please? You have to find him. Check servers around 3, 4, or 5 bars. I bet he will post it soon. Alright. Good luck finding him. Sometimes he can be tricky. Im sure he will soon. He's probably getting it ready. You need to put the rh tracker up! Oh and to be helpful, rh's fav places are the iceburg, puffle circus, pizza parlor, and the migrator. I found him once, a long time ago! i was wondering where the rockhopper tracker was though. go mimo777! Yesterday I found Rockhopper randomly at Permafrost at the cove and he told us a story about how when he went fishing, he wasnt catching enough boots! So he returned the fishing line and the guy gave him a new one! The guy waved his wand and he said it was now a magical fishing pole! Rockhopper tried it out and he caught the fanciest boot he had ever seen! He said it tasted better than stinky cheese pie! Then he said his goodbyes and how he left yarr at the circus! Thats it! I found him the first day on cristmas!!! I got stamp and backround! Now i have 2 RH backrounds! He is the only famouse penguin i has seen. Man, I almost had Rockhopper for the first time but when I pulled up your website it logged me out of CP!! No FAIR!! I haven't met him since last year and that was my only time! i found him... HE WAS HILARIOUS! he put pizza on my head! He mentioned stuff like "Let go to ye fair!" or "Yarr did you steal the logs?!". He was nice. The weird part was, I was in the town and I got a stamp when I sat down, and there rockhopper was. I screamed "ROCKHOPPER!" then everybody was excited. I got his background then went to my friend's iggy. She was editing so I started throwing snowballs, tooting, dancing, waving, etc. And she said "What?" and I said "ROCKHOPPER AT THE TOWN!" And it was really fun and we went all around the island! Heya, well done for finding RH, i'm gonna go and look again now, wish me luck!! I just realized how the present puffles now look different from the past puffles; the ones now look cute! I CAN GET HIM FOR BEANS! Hey! Thats so unfair! 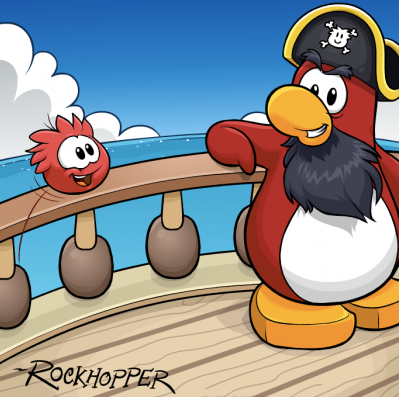 My freind already met Rockhopper once! HE didn't even get the stamp! He got the backroung, though. Cool! I found him last night aswell! Who can beat my puffle paddle highscore of 2101 tickets? If you beat it tell me! mimo, it would be really helpful if you would make the RH tracker available. there is a way you can make your computer move faster. all you have to do is click the = sign on your keyboard. (not in chatbar) it makes the quality low...but atleast the computer moves 10x faster! Waddle on! RH changes places a lot. You have to find him. Its like hide and seek. One time he told us stories at the Ice Berg, another time he said "follow me!" and went into the Member's Only Puffle Circus. Then the last time, he just danced and said arg matey's a lot. In my whole life I found rockhopper 12 times and i found him 8 times yesterday!! i was able to do this because i found him on one server then he goes in a specific order in servers so i go to the servers nd hes there and the stamp and bg for rh is awesome!! I finally found him! I got his new cool background and the stamp. I put the stamp on the cover of my Stamp Book! tundra:cove go now for rh hurry! I've met RH 3 times! This time he said "Do ye hear that? It sounds like playing for me next adventure! See ya maties". Then he left. I met Rockhopper! He was on Mammoth. And wanted some cake, gave us two stories and played tag. Same here! I met every single famous penguin before the stamps and now I have to do it all over again. I have the same problem about homework aswell! Cool! I met him too, now I have three of his backgrounds! what server is he usually on ? I didn't know he was in the room then I saw that it said: "You Eanred the stamped, Rockhopper!" And rockhopper was selling pirate mushy smoothies! I MET HIM he was at the iceberg at yelled TOOT POWER! then he went down the slide! Wow! I just played Treasure Hunt and I found the emerald!